We brought our mother here for a fun Mother's day weekend. We rode the train ride in Bryson City and has an awesome time. We enjoyed the beautiful cabin. Very clean and comfortable. We loved the view and listening to wildlife. We will be back. Weekend celebration trip, had a great time! 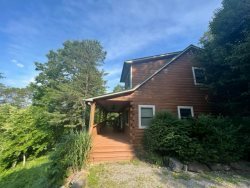 Good Secluded cabin, but close to everything, amenities good, comfy beds and couch. Had a great time cooking here and relaxing after hiking and enjoying good eats. Thanks again hope to be back soon. we brought our mother here for a fun Mother's Day weekend. We rode the train ride in Bryson City and has an awesome time. We enjoyed the beautiful cabin, very clean and comfortable. We loved the view and listening to wild life. We will be back. What a lovely home! We are spending our 40th anniversary here and there are no words to express what a peaceful relaxing and enjoyable time we are having. We will be taking lots of memories with us. My husband went on a moose hunt in the cabin and found 78. We were here for mom's 50th birthday and we had an absolute blast. We went to Harrah's. The views are breathtaking. We are definitely enjoying our stay. Come with for family for WCU graduation. Had a wonderful time. The cabin and the view are spectacular. Wonderful cabin, beautiful view. We were not missing anything at all. Thanks for an amazing trip. Came with the family for a WCU graduation. Had a wonder time. The cabin and the view are spectacular. Everyone was very helpful and extremely friendly. This is the first experience with renting a place like this and everything went smoothly. The directions provided made finding our cabin very easy. We came to this cabin for our honeymoon! This cabin is breathtaking and we couldn't get enough of the views. The ride over the mountain to Gatlinburg was the prettiest stretch we've seen. We saw turkey's and a bear and lots of elk. IT was incredible. We will be back. They assisted us in locating a cabin and even called to verify that we had arrived. Good service from start to finish. Thank you for a fantastic week in this beautiful cabin. Your place is absolutely gorgeous and comfortable. Such great views also. The location is also so convenient to Bryson City. We had so much fun visiting the town, hiking and checking out the sites. We saw lots of wild life. This beautiful cabin and its view have surpassed our expectations. It is so beautiful and serene and even the drive up was amazing. Today we drove into down town Bryson City. It was absolutely charming and we have had a great time This is our anniversary weekend and are greatly enjoying it. Beautiful Cabin, very relaxing. So close to Cherokee and the casino. We are about to move to Florida so we had to visit the mountains on the way. We will be back soon. 2 very happy people who visited this cabin fr a week. We enjoyed the area and the shopping very much. Can't wait to come back. The team is helpful, friendly, and courteous. We absolutely loved staying here. Very nice cabin and Bryson City is a great area with very friendly people. The rental company was very helpful and provided great directions. We will be back soon for sure. Next time we are going to bring the kids. Great place to celebrate out 20th anniversary. Thank you so much for a lovely place to stay. The weekend was just right. We really enjoyed the hot tub. Thank you for a really great stay.